Great. You're famous. Now, let's go. "Great. You're famous. Now let's go." No, not me, but overhead yesterday. 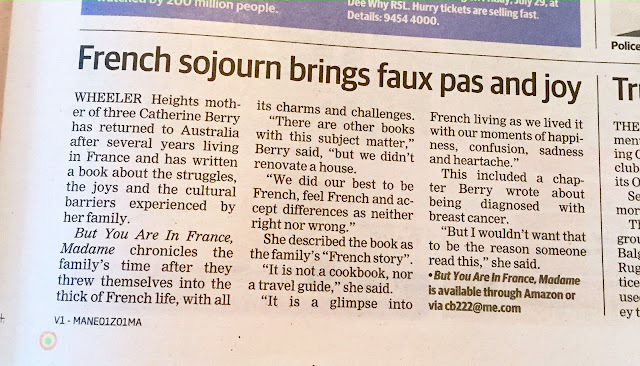 My husband and I were on our way to Canberra where I was to speak at the Alliance Française. As usual, an event like this took a fair bit of behind-the-scenes preparation, not the least of which was packing for our 15-year-old son who was to stay overnight at a mate's place. Should I have let him pack for himself? Most definitely, but...clean socks - meh, two school shirts? (oh, one for today and one for tomorrow), name on trumpet (but I won't lose it...mmm). Loveable, loving and loved, by me, capable of indulgently tolerating the not-so-niceties of his teenage years. Other Mums - let's just say, I was taking precautions. But, back to my eavesdropping en route...We had stopped for lunch and an obligatory browse up and down the main street of the country town. I read a blog recently, written by a French visitor to Australia, where the main streets of non-big-city destinations were described as flat, colourless, lacking interest and rather run-down. With the exception of the shop outside of which I was window licking*, she may have a point. This shop was bright, attractive and filled with gorgeous fashion creations of decades past. And, apparently, these had belonged to my female pavement companion. "Look. In the window. 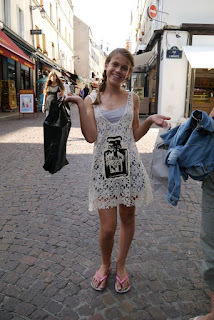 My dresses!" "Great. You're famous. Now, let's go," replied her male friend. I love moments like these. They make me laugh, they make me reflect and I love bringing them up in conversation as they invariably lead to shared stories. My author talks are like this too. They are not always big affairs; after all, I'm an incognito in the literary world, but those who come, do so to listen to our story and share their own. I meet travellers, mothers and fathers who are contemplating their next move, students who are garnering the courage to study overseas in a foreign language, readers, teachers, language lovers and, as was the case, with last night's event organiser, Elodie, French students, here in Australia, to explore the world down-under. Let's shop. Paris, not said country town. Despite our exchanges being warm, light-hearted and friendly, Elodie and I spoke in French, politely using the 'vous' form. It struck me that even after all these years of living and speaking French, this cultural difference still sets me apart. I wanted constantly to use the 'tu' form. Despite my comparatively advanced senior years, I didn't feel any hierarchical need for distance, my instinct was for a rapprochement and I felt a degree of discomfort with my inability to quickly broker the gap between stranger and acquaintance. A big thank-you to the Alliance Française de Canberra for your welcome last night, especially to Elodie for helping pave the way for our event. It was lovely to meet you all.